Love, Actually: Carving out a Winner!!! I was very pleased with the variety of the submissions--so thank you to all who sent me your pictures! 3!! because it's not easy to carve the silhouette.. These are all great, but I have to go with #4. 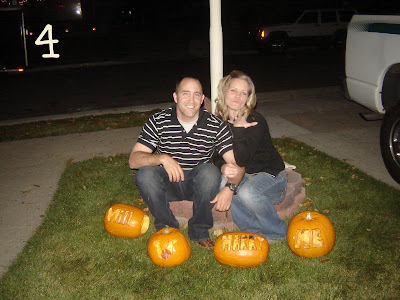 A marriage proposal involving pumpkins?! That's awesome!!! #4. You're criteria was to "unite a family" and seriously there is no way better to unite a family than marriage!!! Congrats! #5!! Look at the size of that pumpkin!! I'm going with 5, the picture is cracking me up!!! Number 12 is SO cute! But I also love number 8. #2 for sure...Jumpman for life! I love number 4. That is awesome and a story that will never be forgotten. Congrats!! I'm going to have to vote for 12, because that's my little pumpkin. I like #7, very spooky! #2!! Go Dani and Steph!!! 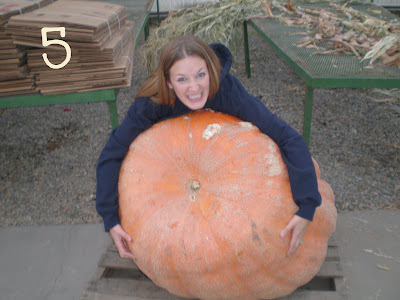 My kids and I vote for #5...that is one HUGE pumpkin! #7. I LOVE NBC and they did such a great job with these two! That's a hard one! I'm going to go with #7. I vote for number 10. I love the BOO made into the ghost! 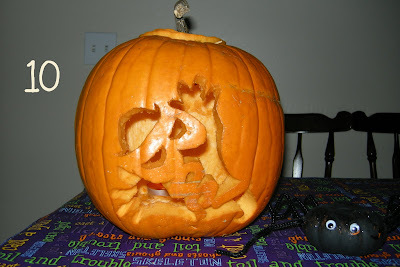 Oh man, I completely forgot to enter my pumpkin!!! Oh well....my vote is for #4. What a great idea!!!! #5!! it takes a lot of time and love to grow a pumpkin that big! Okay number 4 is Fantastic!! But- I LOVE #1. Such a cute family pumpkin!! I vote #6 because that's clearly family oriented. And those are such fine lines! #2 because my boyfriend loves the NBA and because the cute little face is exactly what I would have done haha. Nice!! #5, because that crazy neice of mine might have an issue if I didn't vote for her! #5 for sure!! She is for sure the cutest girl ever!! That pumpkin is as big as her... no for real it is!!! #5 is my vote because I am all for the non-carving of pumpkins... just home grown Love!! Number 12! There is a baby in the pumpkin! #4!! #4!!! On the 30th it will be 1 year since that awesome night! they are all excellent but my vote is for #8! It's a toss up between 4 and 5 for me. I love the proposal idea but I also like the big pumpkin. #7 is my favorite, because I know how hard it was to carve those pumpkins. #5 is alive. Nice gourd. I'm gonna have to go with #12 - that's one cute idea!! I vote for 5, my guess is its way beyond the normal ability of a kid to do that good a job. Now if it was carved by a 30 year old then I feel stupid. Gotta vote #8 - I love it! But #12 is stinkin' cute too! I think #1 is the hardest pumpkin because of those letters. I do like #12 though because of the baby and the scary face pumpkin. Heck...they're all great!! Gotta go with #4! How romantic! #6!! 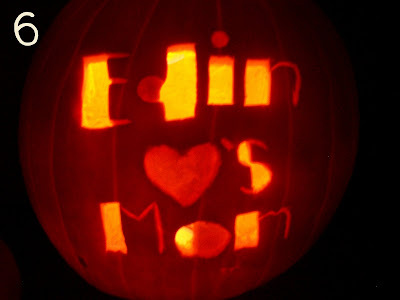 I carved it for my new born, Edin. He was two weeks old when Halloween came. #8 I love the love birds!! oooh..we've got alot of diverse comments--- I like em! **Make sure only ONE vote per person. You can send whoever you like to vote as well...but you're on your honor for yourself! Thanks! I've gotta do things like this more often...so much fun, right?! I vote #2! Air Jordan all the way! #12... nothing says family like a bay :-) Plus the baby is just so cute!! #8...it's classy and beautiful and just embodies romance. #2 All the way!!! Go Dani and Steph! #2! Goo Dani and Steph! Okay...First, I'm gonna turn off Anonymous posting. Second, none of these pictures are cheesy--let's keep it friendly, Anonymous. I have disqualified that vote. Thank you! #4 what a way to propose! I loved #12. I am thinking that I may just have to do a photo shoot next year with my little niece! Adorable. I like #10. It would have even looked better lit up at night. 100% Vote for # 4!!! What a creative guy!!! Such a great idea and fits the theme best! #1, love the name Finley. Super cute pumpkin, I love it! Number 7 for sure! They are awesome...and Halloween-ish! :) Good job! Love birds on a pumpkin! So cute! #8 is my vote!